This versatile pattern contains instructions on creating a popular accessory that’s easy to make; a scarf with buttons placed in two rows to turn the scarf into a cowl that can be used everyday for warmth or for a touch of style. Wild it up by using contrasting colored buttons or even mismatched ones! Gauge: not important for this pattern. Use the instructions within the pattern to adjust the size as you see fit. Start by chaining 26 or a chain as wide as you would like your scarf. Repeat Row 2, 62 more times or until the scarf is as long as you desire. Finish off. Attach yarn at bottom right corner of beginning row. Sc in each hdc along the bottom row. 3 sc in first corner. sc evenly along side of scarf (about 2 sc for every row of hdc). 3 sc in next corner. Sc in each hdc on end row of scarf. With thread and buttons sew one button in the second row of hdc, near one side of the scarf, sew a second and third (or as many as you have chosen to use) buttons along that row evenly spaced. Do the same thing in the 10th row of the scarf , making sure that each subsequent button lines up with first rows buttons. 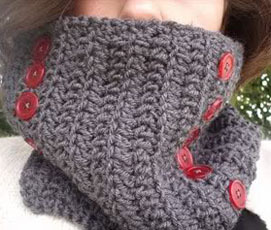 The buttons are used to make a long scarf into a funneled cowl. Buttoning the buttons into the opposite end of the scarf will create the funneled cowl. The buttons on the second row of the scarf from the end can button on anywhere from the fifth to the tenth row of the opposite end of the scarf, depending on how tight you want the cowl to be, then the next row can be buttoned closer to the end accordingly. If you have any questions or comments please do not hesitate to comment here on this post! 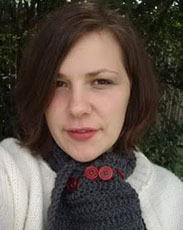 This entry was posted on Thursday, July 1st, 2010 at 6:00 AM by Erin Burger	and is filed under Free Crochet Patterns. You can follow any responses to this entry through the RSS 2.0 feed. You can leave a response, or trackback from your own site. Oh nooooooo! It looks like I need to buy more yarn! Seriously, I love the simplicity of it and Ican’t wait to get to the yarn store. I love this post. It was so easy to read, and the design is amazing! Thanks Erin for sharing you wonderful talent with us! Oh snap! When I got the newsletter and noticed this little gem was being shown as a free pattern, I flipped out. Hopefully I will get it made and ready to go before fall starts and the Nebraskan chill drops by. I’m having a little problem with this one, and I’m not sure if it’s because I’m a poor old janner in England!! I’m using a 6mm hook, and wool which I am assured is Aran weight. Problem is, whilst I get 14 stiches to 4 inches, I’d need about 128 rows to get 40 inch length, not 64.There is no way buttons of the size shown in the picture would ever go through the stitch gaps on my piece so what do we think might be wrong? You mentioned that you are English? Are you used to using the UK abbreviations for patterns? Sorry about the long wait, I did not notice your question. What I can’t get my head around is how the stich count per inch can be right (from comparison charts for yarn weights) but the row count per inch can be wrong for the pattern, and hence the stitch size. I happened to have a small amount of the same worsted (could be called aran) weight yarn I used in a customer’s order (the same scarf from the photo) and made a quick swatch. I chained 26 and then made 3 rows, the total width of the swatch (without the border) was 11 inches (27.94 cm) and the length of the 3 rows was a little over 2.25 inches (5.72 cm). So at that rate the whole scarf would finish at 46.5 inches (118.11 cm), which is a little bit longer than the stated approx. length in the above pattern. I may be in a much more relaxed mood today and thus crocheting a bit more loosely. I also happened to have the same type buttons that are in the photo and they slid easily through my stitches. I have no idea how you are getting a stitch so short that you would need that many more rows to reach the 40 inch (101.46 cm) mark. If there’s nothing we can come up with together, perhaps you can use a dc or tr stitch instead of the hdc in order to create a stitch big enough you. Don’t hesitate to ask any further questions about completing this pattern, I’ll be glad to help.